The Azure Data Lake offers fully managed and supported 100% Apache Hadoop®, Spark, HBase, and Storm clusters. You can get up and running quickly on any of these workloads with a few clicks and within a few minutes without buying hardware or hiring specialized operations teams typically associated with big data infrastructure. You have the choice of running Linux or Windows with the Hortonworks Hadoop Data Platform, making it easy to move code and projects to the cloud. Finally, the rich ecosystem of Apache Hadoop-based applications provides security, governance, data preparation, and advanced analytics, letting you get the most out of your data faster. With Data Lake, Hadoop is made easy. Finding the right tools to design and tune your big data queries can be difficult. Data Lake makes it easy through deep integration with Visual Studio, so that you can use familiar tools to run, debug, and tune your code. Visualizations of your U-SQL, Apache Hive, and Apache Storm jobs let you see how your code runs at scale and identify performance bottlenecks and cost optimizations, making it easier to tune your queries. Data engineers, DBAs, and data architects can use existing skills, like SQL, Apache Hadoop, Apache Spark, and .NET, to become productive on day one. Data scientists and analysts can use a rich notebook experience powered by Apache Spark or your preferred visualization tool, such as Power BI, Tableau, or Qlik, to do interactive analytics over all of your data. Data Lake is a cost-effective solution to run big data workloads. You can choose between on-demand clusters or a pay-per-job model when data is processed. In both cases no hardware, licenses, or service specific support agreements are required. The system scales up or down with your business needs, meaning that you never pay for more than you need. It also lets you independently scale storage and compute, enabling more economic flexibility than traditional big data solutions. Finally, it minimizes the need to hire specialized operations teams typically associated with running a big data infrastructure. Data Lake minimizes your costs while maximizing the return on your data investment. 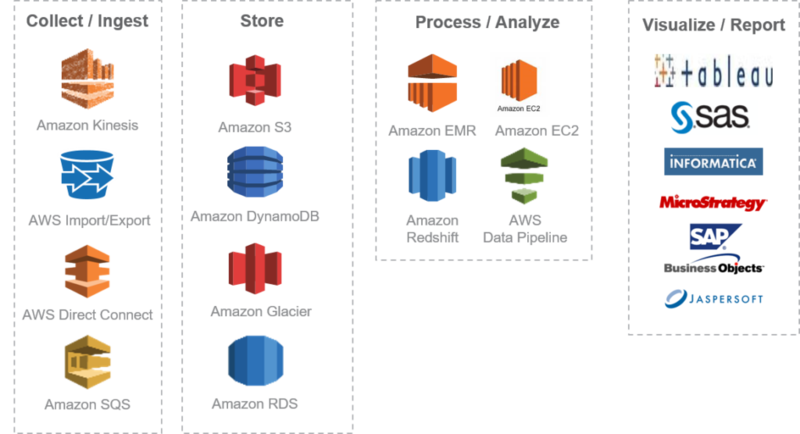 Amazon Web Services provides a broad range of services to help you build and deploy big data analytics applications quickly and easily. AWS gives you fast access to flexible and low cost IT resources, so you can rapidly scale virtually any big data application including data warehousing, clickstream analytics, fraud detection, recommendation engines, event-driven ETL, serverless computing, and internet-of-things processing. With AWS you don’t need to make large upfront investments in time and money to build and maintain infrastructure. Instead, you can provision exactly the right type and size of resources you need to power big data analytics applications. You can access as many resources as you need, almost instantly, and only pay for what you use.